You will earn 3,517 Reward Points. Earn 1 reward point for every 1 dollar spent. 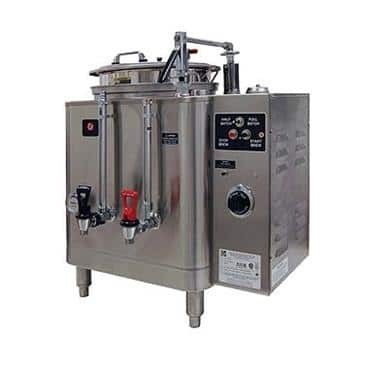 If taking care of your commercial kitchen is important, be sure to add the Grindmaster-Cecilware 74110E AMW Coffee Urn to your must-have checklist. This item is 34.63 inches tall, 26.50 inches wide, and 20.25 inches deep. Durable Construction - All A.I.S.I. type 304, 18-8 stainless steel. Low water cutoff System - Protects heating elements from burn out, at start-up or in operation. Constant Brew Temperature - Brew temperature varies less than 5ºF (3ºC) throughout spay over. Automatic refill of water compartment - Water compartment automatically refills and reheats as needed. Automatic Coffee Agitation - Thoroughly mixes brewed coffee immediately after spray over is completed. Velvet Smooth Spray Arm - Teflon® coating on spray arm piston prevents liming and insures smooth operation. Positive “stops” on spray arm for operator ease. Fresh Water Brewing - Water used for brewing is fresh water that is heated in a coiled, nickel-plated, copper heat exchange tube inside the urn. As water passes through the heat exchanger coil it is heated to optimum brew temperature. Dial Thermometer with color-marked brew zone. Thermostat adjustable from front - Knob on thermostat has four marked positions: Brew, Hold, Night Standby and Off. Fully Automatic Push Button Operation - Simply load brew basket with coffee, align spray arm over basket lid hole and press brew start button. Control drawer with all electronic components is accessible from side. Specify electric service desired. Standard is dual voltage 120/240V or 120/208V single phase 3 wire (neutral wire required). Watts and amps as shown. Note: A ground wire must be provided in addition to wire service shown. All service includes terminal block hook-up. Twin and single automatic urns MIL-U-43263E or latest specification. Available modified for marine (shipboard) use; no spillage of liquid with 15° list in any plane, and other requirements. Contact factory for detailed quotation and data.